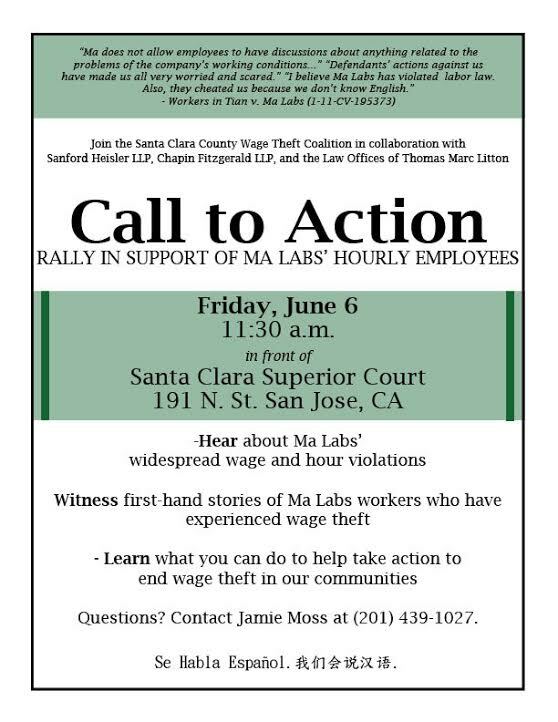 WHAT: Plaintiffs in Tian v. Ma Labs allege Ma Labs has not been paying workers for all of their on-the-clock work and failed to give workers off-duty lunch breaks and rest breaks. They allege Ma Labs exploits its low-wage workforce, mostly limited English proficient recent immigrants, by making them sign waivers and release of their rights and retaliating against those who resist. WHEN: June 6 at 11:30 a.m.
RSVP: Please call Julie Ramirez at 299-5135 if you plan to attend. Please forward to all of your networks. Hope to see you there!